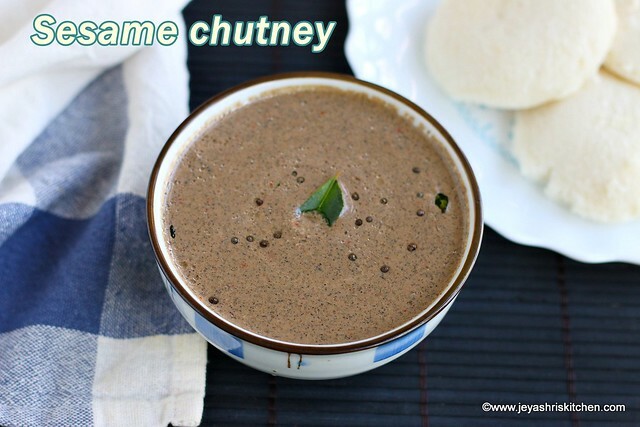 Ellu Chutney, sesame coconut chutney, Til ke chutney a chutney with coconut, sesame seeds and red chili as main ingredients and garlic adds a flavor to the chutney. Last week we had my friend's family over here and we had a fantastic time reliving our childhood memories. While i was making dosas for all of them one night, she was sharing her mother in law"s chutney recipes. All the recipes she shared sounded so delicious and i tried this ellu chutney on the next day itself. I posted that on Instagram too. This is the first time i am tasting ellu chutney and i am addicted to this chutney. Few other chutney recipes which she shared will be posted in Jeyashri's kitchen soon. Check out my collection of Side dish for Idli, dosa,Pongal. 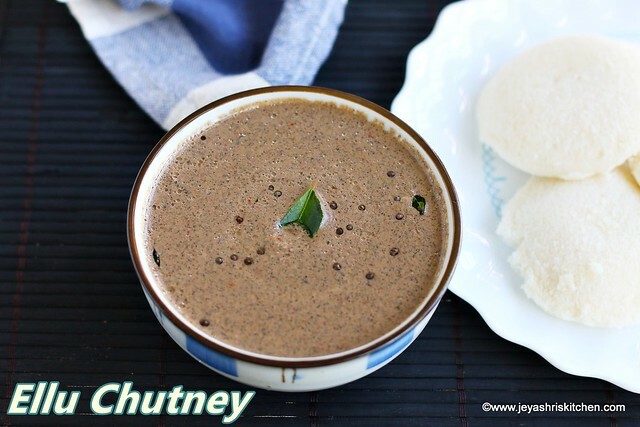 Ellu Chutney, sesame seeds chutney, a chutney with coconut, sesame seeds and red chili as main ingredients and garlic adds a flavor to the chutney. In a pan add oil and add the coconut. Cook for a minute and add the red chilies. Saute for a minute and add the sesame seeds. Do not cook for too long till the sesame pops up. Grind into a smooth paste along with garlic and tamarind. Temper with mustard seeds and mix well. 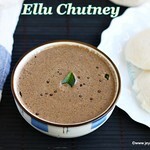 Ellu chutney is ready to serve with idli and dosa. Do not add more ellu ( sesame seeds ) than the mentioned quantity, it will give a slightly bitter taste. You can also use white sesame seeds for the ellu chutney. Nice. There is Ellu Chutney variation with Curd demonstrated by Chef Venkatesh Bhatt. I don't know if you are aware of it.